Home » Blogging Business » Is Your Hosting Keeping Your Blog from Growing? Is Your Hosting Keeping Your Blog from Growing? Wondering what’s holding your blog back from exploding with page views? The answer could be as simple as your hosting account. Find out if your hosting is a problem and if so how to get it fixed! Hosting is the service that keeps your site available to the public, and if you don’t have reliable hosting, then your site is not reliable to the public. For example: You pin one of your recipes to a large group board and the hits start flooding in! In less than 3 hours you have 15,000 views on one post! That’s a LOT of page views lost and a LOT of revenue lost! It happened to me twice before I learned my lesson (through many tears and pulling out of hair!) and moved to a better host. In fact, I had a HUGE influx of page views at Christmas (I went from 45k page views per month to 153k page views in 1 week!) and since I had reliable hosting my site kept working perfectly so that I could reap the revenue rewards of all that traffic! >> Don’t have a blog yet but want one? Click here for the 3 steps you need to take to get started today! If you are trying to grow a blog you are likely experiencing peak days where a post just goes crazy! On those days your hosting will either help you, or hurt you. With great hosting your site functions perfectly during those upswings and allows new users to really enjoy your site. They’ll browse a page or two and come back for more! 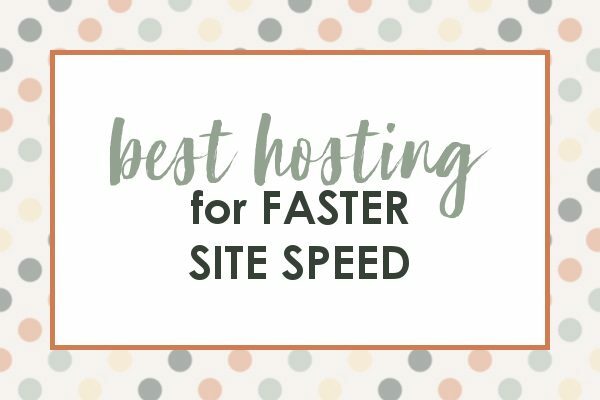 With terrible or slow hosting your site is forgettable for all those new users. Imagine if your page takes a full minute, or even THREE minutes (like mine used to) to load?? Do you think most users are going to stick around for that? Nope! Most people want lightning fast site speeds or they are out of there! Why Do Hosting and Site Speed Matter? The last time my site crashed I was right in the middle of this HUGE viral post! Not only did I practically have a heart attack when I logged on to see that my site had crashed in the middle of a huge viral post upswing, but I had to deal with the headache of getting it restored over the next few days. Not to mention all the income that I lost out on from those ad impressions and potential product sales (over $3,000 in lost revenue! ), as well as earning repeat visitors with my amazing load times! And sadly, this was the second time my site had crashed… In fact, the first of the big crashes came the day I launched my first ebook. Sales were rolling in, I was glued to my computer in glee as the product flew off the proverbial shelves… then suddenly my site was completely inaccessible! It took me 5 days of calling my then current hosting service (Bluehost) and attempting to get the site back up. Then later, when I had a post go viral the next month and suddenly I was dealing with the same issues all over again! This time I finally learned my lesson and made the switch to SiteGround.com! I talked with their customer service reps (available via phone or chat, but chat is so super fast that I always use that method!) about the page views allowed at each level and picked one that would allow me to grow my site without worrying about it crashing every 2 days! Sadly, I did have to learn this lesson twice before I was willing to make the switch, and it cost me a lot of lost revenue in the process! Currently I am with SiteGround.com and absolutely adore them! Their starting services cost the same as Bluehost.com (the service which many bloggers promote) but the SiteGround.com service is far superior to that of Bluehost.com. I was with Bluehost.com for 12 years without any issues, but as soon as my blog started really taking off I had a ton of problems keeping my site up. I finally switched to SiteGround.com and haven’t looked back! It’s the same price and their service is phenomenal. Is Siteground Better Than Bluehost? 5 years ago, I would have said no. However, after 12 years and 8 blogs of hosting history with Bluehost where everything was fine (then suddenly wasn’t for over a year), I can now say that yes, Siteground is better. Bluehost recently underwent a major shift in the way that do business and as a result the service has gone down in a big way. No matter where you are in your blogging journey, if you want to gain page views, and make real money from your blog, then you really need to look into switching your hosting service. I now have all 8 of my site with Siteground (they aren’t all actually mine, most are hosted for friends and family!) and I have had zero issues! They will even move your site for you at no extra cost. It’s been the most amazing experience ever and best of all, I don’t have to worry about losing out on revenue or repeat visitors to my blog because I know that my site will be up 100% of the time and loading at lightning fast speeds! Ready to get started? Click here to check out Siteground’s services! This is scary! I’m with Bluehost and have been for nearly 5 years now. Like you said, everything is fine right now, but I haven’t been over 5k in pageviews either. Definitely thinking of switching to Siteground as I’ve heard many good things about them.